The Husbeast can actually knit. Well he can let me cast on, knit in garter stitch, pass to me whenever he makes a mistake and let me bind off, but still considering its years since I stepped in a kayak (his hobby) I appreciate the effort on his part. He doesn't really wear much that I can knit for him. I have knit him a pair of socks he wears loads in the winter and has requested more pairs, but I lost my sock needles for ages (I only have one pair to try to discourage my WIP pile from growing any bigger), so there are no socks on my list for him any time soon. He doesn't wear hats particularly and the one hat I knit him was way to big, went on the frog pile and "disappeared". So when he asked me to knit him a scarf over Christmas I decided it was time I made him something. 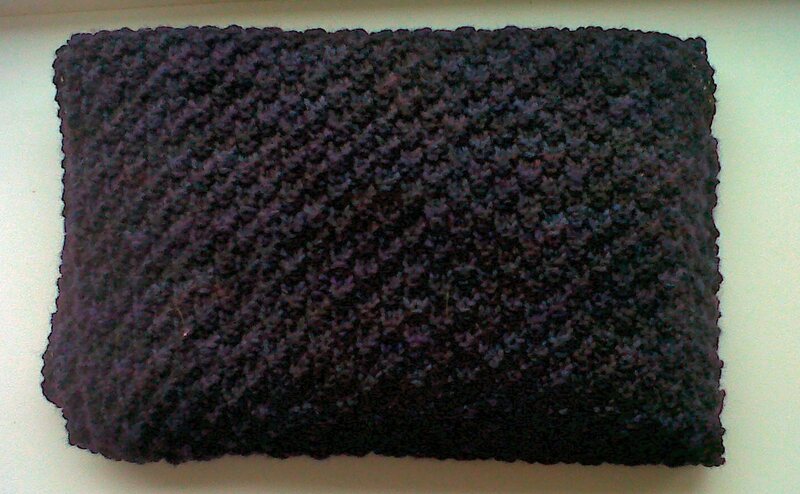 Especially as he asked for it in Moss Stitch which is apparently his favourite stitch pattern. Which basically means he's been paying attention which makes me love him all the more. So I cast on 60 stitches on 4.0mm needles in Posh Yarn Martha Sock and knit in moss stitch until I ran out of yarn which took forever (or at least that's what it felt like). It was the perfect project for over Christmas though. I could knit it without concentrating too much over Christmas when the family was round. Then after they'd gone it was also perfect to knit whilst watching the Husbeast's Christmas present to me, the last season of House MD which we love.